Mercedes-Benz has rejoined the top-tier of luxury automakers after a decade, or more, of struggling with design and execution while other luxo-makes were raising the bar. Nearly two years ago I praised the GLK350, a small luxury ute that hit on all cylinders for luxury, equipment and performance. Now Mercedes goes deep again with its C300 sedan, one of its bread and butter offerings, a compact to mid-size sedan along the dimensions of a Lexus IS or, for us less monied folks, a Mazda6. 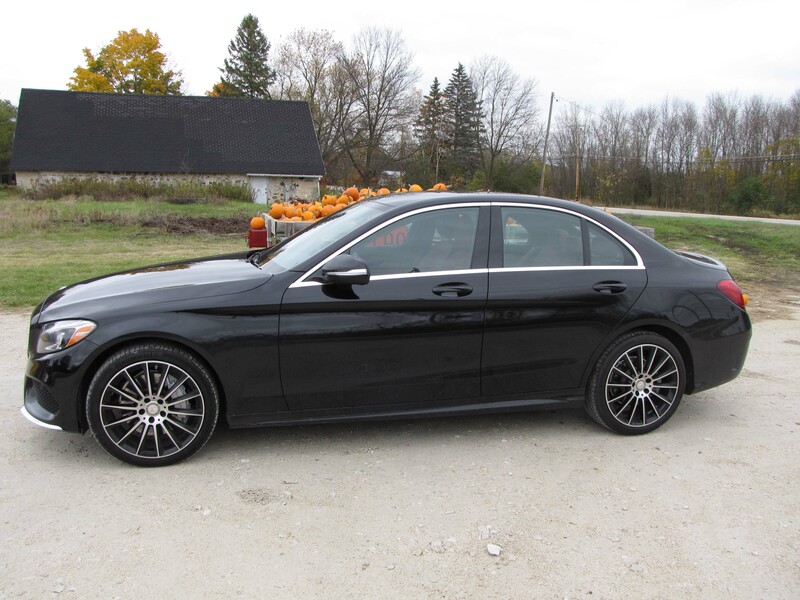 The C Class rides on a smoothing 111.8-inch wheelbase and weighs a middling 3,583 lbs. The car feels delicious. How so? It’s a scrumptious blend of sporty power, an eager 2.0-liter turbocharged I4 with 241 horses, and comfort. All that starts with a silky 7-speed automatic transmission that easily harnesses the turbo’s 273 ft-lbs. of torque, and cushions the ride with independent suspension at all four corners. Ride is absolutely stellar, controlled and easy on the occupants, but still responsive enough to lend the car a sporty edge. Cornering is smooth with minimal body lean and as precise as you want it to be. That’s courtesy of the test car’s Agility Select system that allows the driver to toggle through four settings, from Eco, to Comfort to Sport to Sport+. Moving up from Eco, each setting adds a few hundred engine revs and slightly firms the steering and ride. Eco naturally provides lackadaisical acceleration and a soft steering effort, but Comfort is close to right on for city driving. The C300 still has good power and handling is forgiving. But for any fun at all, the Sport setting is required and delivers a decided power boost, about 400 rpm at 40 mph, and firms the steering effort to moderately responsive. Go to Sport+ and the revs jump another 300-400 and steering becomes sports sedan firm. Perfect! Mind you the Airmatic air suspension and agility system are part of a $1,190 package, but well worth that if you really want to personalize the ride. No matter the setting, ride remains well controlled, never becoming harsh. 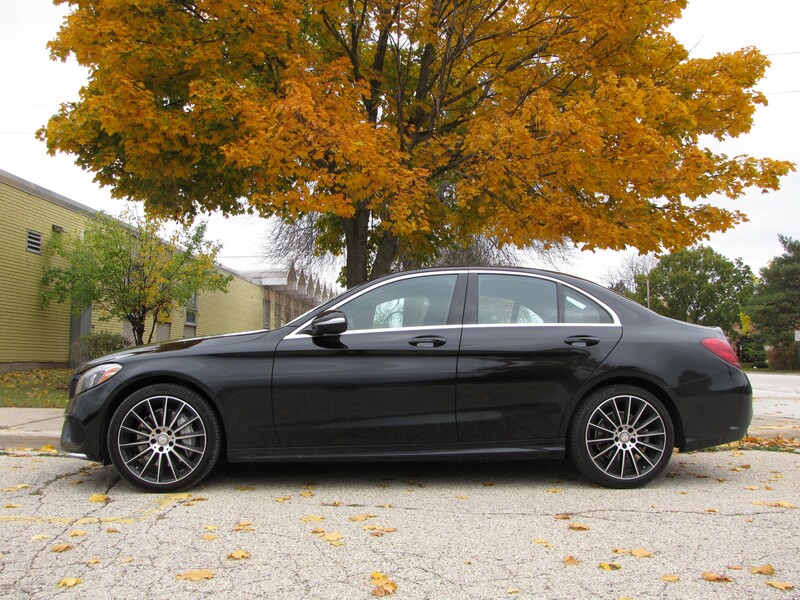 The black test sedan featured 4Matic too, that’s the Mercedes all-wheel-drive system and it gives the car excellent traction and acceleration, easily tested on extremely wet Milwaukee area streets during my drive. Braking naturally is first class, the C300 featuring large drilled disc brakes. This one also added 19-inch performance tires, while 17-inchers are standard. 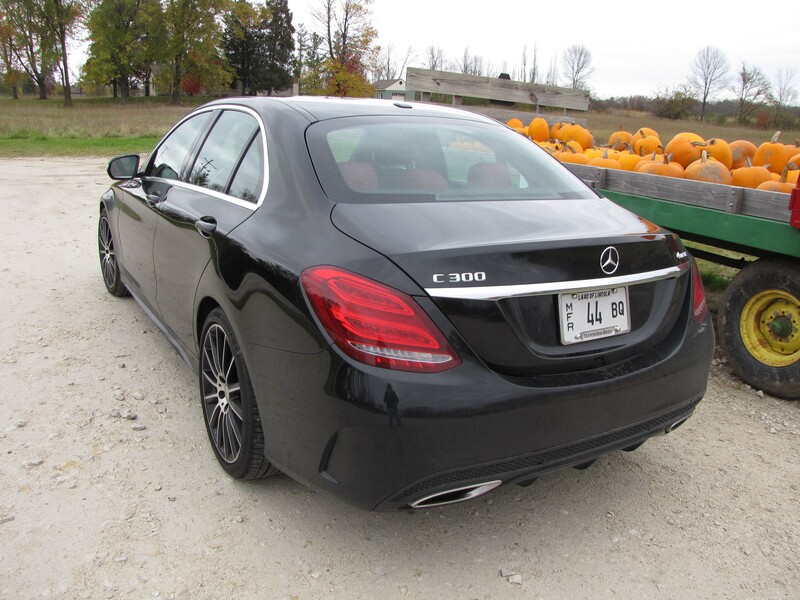 The tires are part of a $500 package that included fancy AMG labeled wheels too. All this would be a moot point if the Mercedes didn’t deliver a luxury look and sporty stance. But it does, the trademark Mercedes grille being neatly updated and swept into the car’s flowing lines. I think its ¾ front view is as handsome as any luxury sedan on the road. Naturally there’s a price to be paid to move into this neighborhood, but you might be surprised at where it starts. The test car listed at $40,400 plus a $925 delivery charge. Ah, but the goodies list was nearly $12,000 to put the test car at $52,735. I admit to liking many of the options, but you Could go basic and still have a delightful luxury sport sedan. Here’s what the test car did to improve its lot. This flat black ash trim on the console and center stack looks high-brow. And check out the big iPad-like nav/radio screen. First, it added black ash open pore wood trim for a modest $325. I prefer brown wood, but this looked elegant and was more textured and natural looking than most of that high-gloss trim most luxury cars have boasted for years. An interior package with subdued red leather seats and black dash and door trim also included a 3-memory passenger’s seat, cooled front seats, along with illuminated doorsills and snazzy overhead ambient lighting. Cost is $2,300, but it looks great, along with the matte metallic trim on the steering wheel, doors and five round air ducts (3 mid-dash). The entire dash looks elegant with metal switches and knobs and an iPad-like screen that looks like a tablet has been mounted on your car’s dash. Techy and fun! Gauges are easy to see and well laid out. I give a big shout-out to the flat-bottomed power tilt/telescope steering wheel. That flat bottom gives a short driver much appreciated room to maneuver. Plus this one powers up a bit once you open the car doors. Sadly though, the steering wheel wasn’t heated in the test car. The front seats are fairly flat-bottomed themselves, which makes them easier to get in and out of, but the backs offer better side support. Still, I would have liked them to be more snug, so adjustable side bolsters would be welcome. Back seats are comfortable. 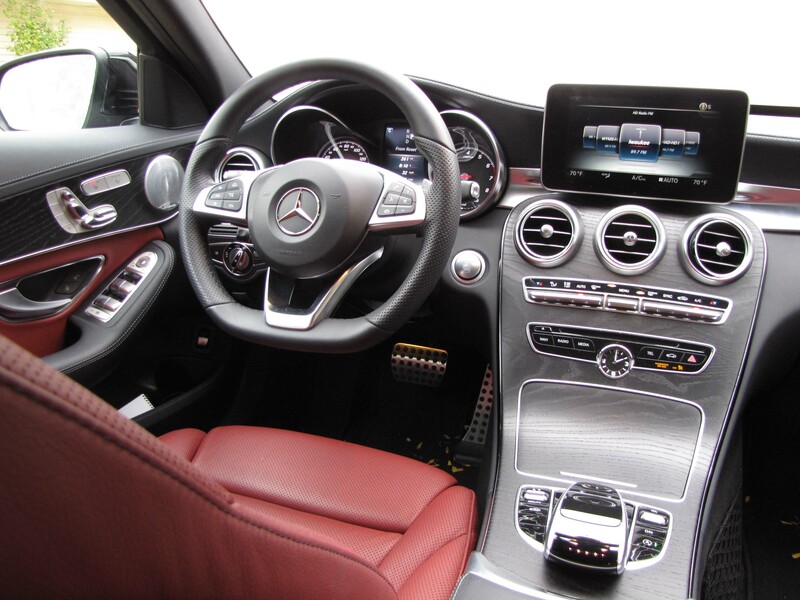 You can haul four adults in the C Class with ease, provided none are NBA sized. 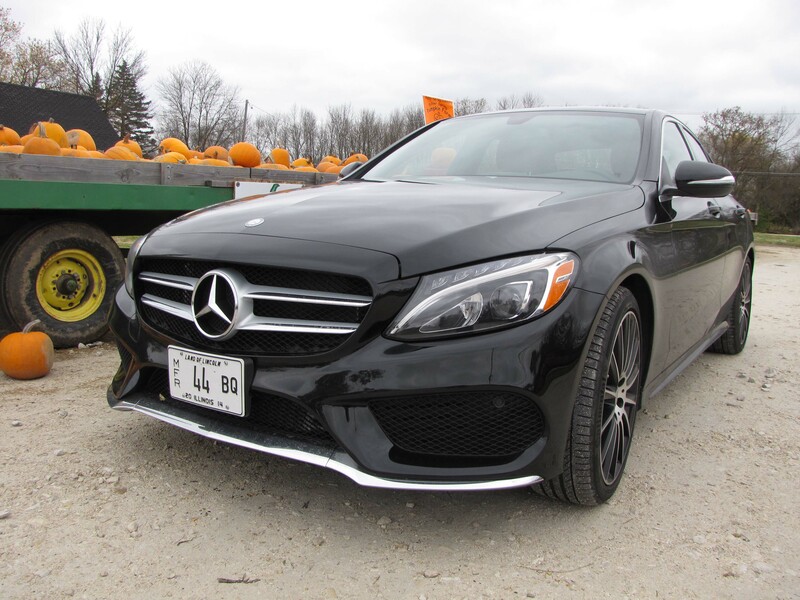 A premium package worth $1,680 on the test car added heated front seats, satellite radio, LED headlights and a rockin’ Burmester premium sound system that several riders praised. 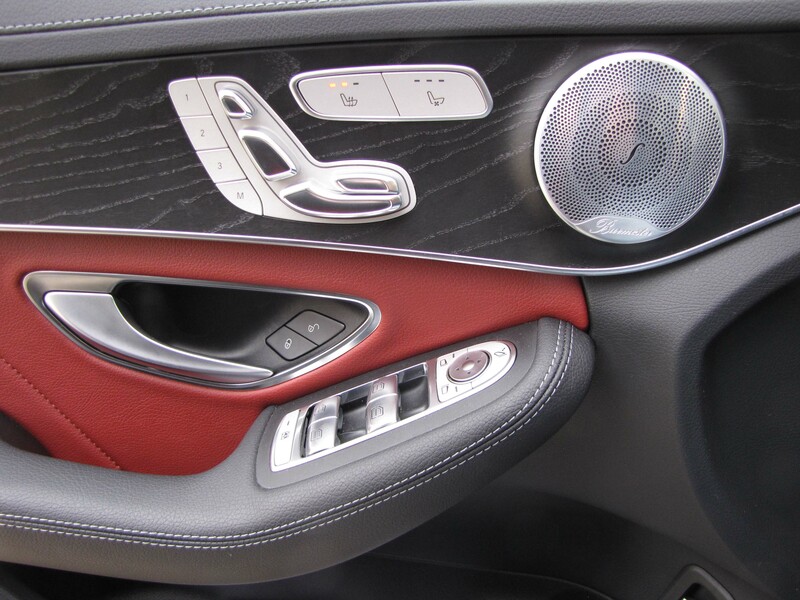 Power seat controls are on the beautifully trimmed door, and the Burmester speaker looks like some of Mr. T’s jewelry. 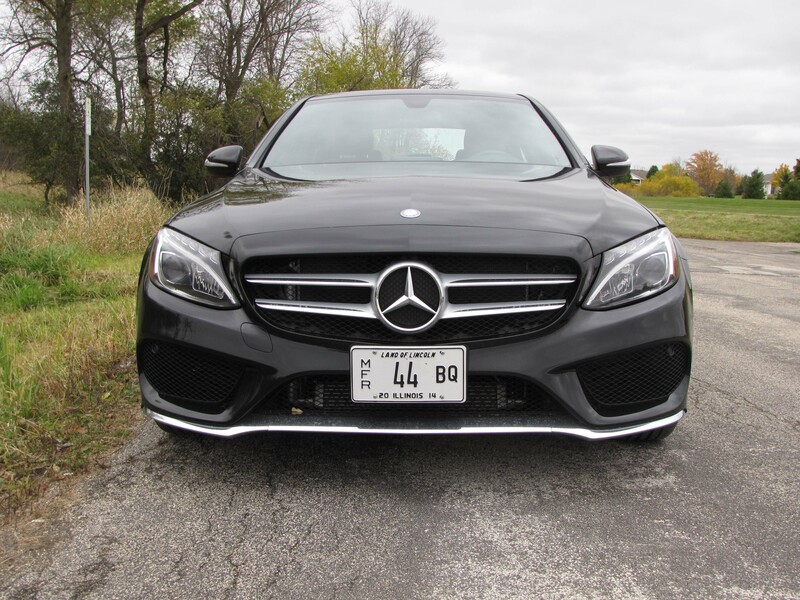 Most important, from a safety standpoint, the C300 added a $550 blind-spot assist system. This lights up in the car’s side mirrors when a vehicle or other object is in your car’s blind spot. It also beeps if there’s something there and you turn on a turn signal. That can be disconcerting, but may help avoid a fender bender. I’m no high-tech electronics fan, but there is a $2,690 multimedia package here that includes that big 8.4-inch screen, plus navigation, voice command, CD/DVD player, fancy satellite traffic updates to show when the freeway is jammed (very helpful around the Zoo Interchange) along with a rearview camera and database system. That said, using all this electronic stuff is not easy. There’s a console knob you can turn to find a radio station, your preferred band width, such as FM/AM/SAT, but there’s a wrist rest hanging over the knob. It too allows some adjustments, but the combo can be clunky at times and distract you from driving. I miss having a few channel selection buttons for the few stations I prefer to listen to regularly. I also should point out the small shift lever Mercedes places on the steering column’s right side. It’s easy to use, but takes some getting used to as it is in the same spot as the cruise control or wipers on many cars. Flip it up to turn on the wipers and it wants to put the car into reverse. The real cruise control lever, by the way, is hidden behind the steering wheel on its left side. Love this interior, it looks great, is well laid out and the flat-bottomed wheel aids comfort while looking racy too. 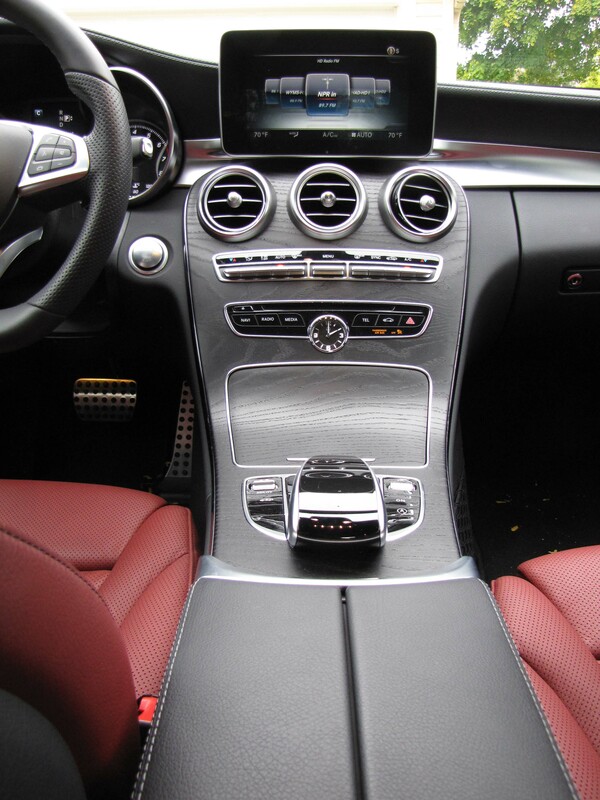 One final option, a $2,175 sport package that includes that delightful flat-bottomed steering wheel with paddle shifters (yawn), fancy AMG floor mats, aluminum sport pedals with rubber studs, some special dash and door stitching and Sport body pieces along with the performance suspension and perforated disc brakes. Not necessary, but all contributed to the test car’s high-performance feel. You’d expect that feel to gobble up the gas, but the turbo is aimed at keeping that in check, although 91 octane is preferred. I got 24.7 mpg in about 70% city driving and a heavy foot to test that turbo. The EPA rates this model at 24 mpg city and 31 mpg highway. Decide just how sporty you need to go, but a C300 looks racy and feels racy, yet with enough luxury and interior styling to let you know you’re somebody special. That’s what Mercedes had lost track of, but for a short while. Its mojo has now been restored! Hits: Stellar ride, good handling, multiple power settings, slick looks and AWD provides great traction. Both front seats heated and cooled plus 3-memory settings, power tilt/telescope flat-bottomed steering wheel, and elegant dash with good gauges and cool iPad-like screen. Misses: Clunky radio/navigation interface with console knob, no heated steering wheel, seat back could offer adjustable side bolsters and column-mounted shift lever takes a bit to get used to. Last look at a beautiful driver’s car. Reblogged this on Uptown Auto News.